If Bill wasn’t born here in SW Florida he would have eventually made it here. 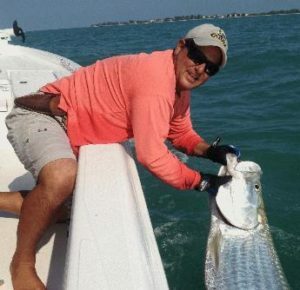 He and his wife, Angela who coordinates the charters for Endless Summer Charters love the life of the islands of Fort Myers and Sanibel and love sharing that knowledge with their customers. Bill’s father, the namesake for Hammond Stadium, the spring training baseball stadium for the Minnesota Twins, moved the family here from Sarasota when Bill was a small boy. As the lead captain at Port Sanibel Marina he manages the fishing guides there and consults with Coastal Outfitters on product they carry. In 2015 Bill won the E Award for Excellence in Hospitality from the Lee Co. Visitors and Convention Bureau, aka, The Beaches of Fort Myers and Sanibel for Best Attraction in Lee County! Capt. Bill likes telling a tale or two from stories that have been passed down through generations of family members going back to the 1800’s. Bill loves giving the experience of S.W. Florida to those that have never been here and a new perspective to those who have. Being a full time career Sanibel fishing guide who is on the water 300+ days a year you are guaranteed the best fishing experience available. 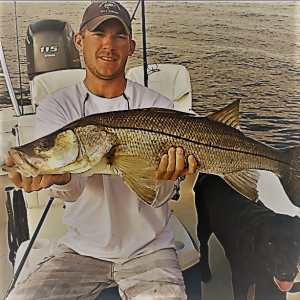 He continually furthers his education as a captain and guide and has gained his USCG 100 ton Master’s license and holds fishing seminars in the Fort Myers, Fort Myers Beach & Sanibel Island areas. Although the newest member of our crew, Ethan comes with the experience of generations of Lee County native fishermen. Ethan not only knows the best spots for fishing but knows SW Florida waters like the back of his hand. He’ll be sure to entertain you with some of the history of the area along with a great day of fishing. Incoming, outgoing, or no tide at all, Capt. Ethan loves fishing. Ever since he was a young boy, he and his four brothers shared cast nets and stories – the Caloosahatchee was their classroom and they were their own teacher. Capt. Ethan’s great-great-great-grandfather, Capt. Manuel Gonzalez, knew the river well. In 1866, after the “war between the states,” he and his young family sailed their skiff from Key West to the abandoned fort – near downtown today – soon after becoming the first settlers of Fort Myers. After several years of school in Gainesville, Florida, Capt. Ethan chose to return home and become a USCG captain. Recently, he traveled to Houston, Texas, with “Captains for Clean Water” to provide assistance to others in the aftermath of Hurricane Harvey. In the Fall of 2017, he and two others, after twelve nights in the Atlantic’s shipping lanes, delivered a 92-foot Lazara to a marina located at the southern tip of Manhattan. When he’s not on the water, Capt. Ethan may be seen playing golf or with his friends watching a Southeastern Conference football game. Regardless, fishing is his first love and there is nothing he would rather do than spend time on the water with you and your friends or family.